NO TIME FOR JOKES! We’ve got to talk about Time Travel! There’s nothing funny about time travel. Who it’s for: People who enjoy getting immersed in stories, people who enjoy solving mysteries, and fans of old school adventure games. Okay, so you wanted to hear about something cool, and innovative, and exciting, and fresh. You wanted to hear about Time Stories. 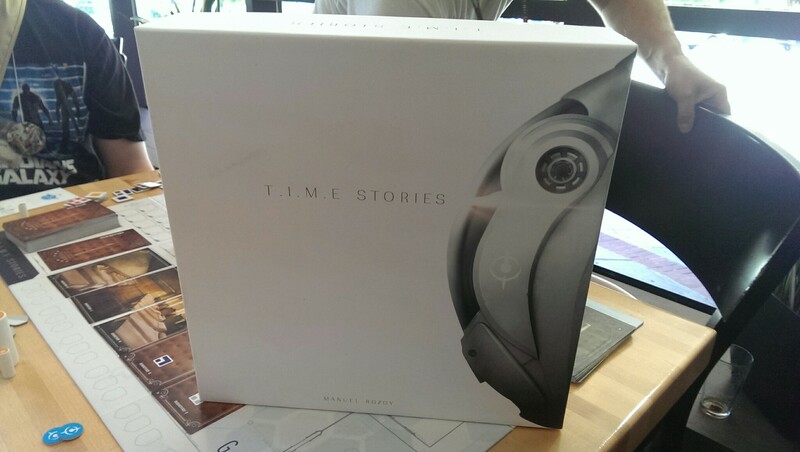 Time Stories is what happens when a novel and a board game collide, and through some quantum re-configuration become one. The best comparison I can make for what Time Stories is, is that it’s like a cooperative adventure game (you know, like Kings Quest, Police Quest, Space Quest…) with a lot of exploration, a dramatic story, and lots of puzzles to solve. I’m going to keep this pretty much spoiler free, so read on for what might be the coolest game coming out in the next few months. The premise of Time Stories in general is that you’re a team of time-travelling agents that seek out potential time rifts. You travel back to those events and stop them before the future is permanently damaged. Or something. Anyways, the premise is mostly to set up the possibility for stories to happen in any period of time, anywhere. And also the time-looping mechanism, which is somewhat similar to Tragedy Looper (after a certain number of actions, everything resets, and all you carry with you is knowledge of the previous loops). Beyond that, the game drops you in a world, and it’s up to you to explore, solve puzzles, and figure out what you need to do to fix the time distortions and save the day! There’s plenty of room for role-playing here – if you’re into that sort of thing. You’re plopped into a character that definitely isn’t your time-travelling self (apparently you can’t physically travel back in time, but your mind can inhabit the bodies of those in the past), and you and your friends are free to improv your own little show. Or you can just focus on the story being presented to you and uncover the mystery; you don’t need theatrics to enjoy the game. This is basically all of the components. Keep it simple, keep it safe. Or something. So what happens is you have a place to explore. You’ll start in a room, that is represented by a row of cards (look at the pictures!) and each card represents a part of the room you can investigate more closely. Talk to the doctor, examine that object, look out the window… well, there are hints to what you might find on the front of the cards, but the details are on the back. If you go somewhere to investigate, you get to read the details – and relate them, in summary, to the other players. No reading verbatim, now! That takes away the fun of trying to explain the convincing story you were just told by a madman. After all, they were off in the corner looking at pictures or something. You might find objects, or discover new rooms in the overall place you can visit. You might also get yourself into situations, such as combat, which requires a little dice rolling. Your friends can run over to help, or they can keep exploring the rest of the room while you struggle – and given that Time is of the essence, there’s a lot of motivation to do just that. 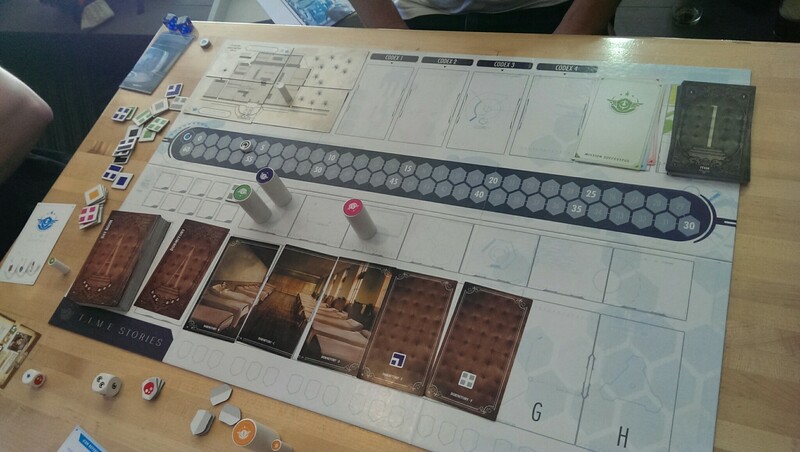 As you wander the place (in our demo, which was the included scenario, we were in an insane asylum) you can only go to the rooms you know about. You’ll talk to characters who reveal new locations, or discover maps and clues, and you’ll have to put things together. Until… well, honestly, we didn’t do the whole thing. I don’t know how you win a scenario, what the overall goal is. I do know that you have to figure it out along the way. Of course everything you do takes time, and when time runs out, as I said, everything resets. So not only do you have to figure out what to do, but do it all in one run, with only your memories to come with you. (Don’t worry, notes are allowed). Now, admittedly, the room for replay value in a single scenario is limited. Once you know what to do, it’s sort of like having read the end of the book; each scenario is going to have a solution, and that’s that. There are branching paths and different ways of approaching it, but ultimately it’s not going to be thrilling to do a scenario again and again. Vasil La Fouine, Coke addict. But really, who isn’t? But the benefit of a pre-defined story is that there’s a lot of opportunity to engage the player. It’s somewhere between reading a really engrossing book and playing a story-telling game; the book doesn’t let you do anything on your own, but storytelling games often lack really good twists or hooks or foreshadowing, the thing that really pulls you into a story. You can take your own path – in fact, we were talking about the demo with another group that had done it earlier, and they were asking about a situation. For a moment there was confusion, until we realized that they had gone completely off on a different way and encountered things we never saw – and vice versa. I’m told that each scenario can last up to about 10 hours, depending on how long you get stuck on certain puzzles. And that’s important – tough puzzles and well-written stories are what will make this game worthwhile. If you’re worried about pulling together 10-hour gaming sessions, don’t. The box is designed so that you can “save” your progress, allowing you to play for an hour or two at a time, then call it quits. Just make sure to take notes. There’s also plenty of room for expansion – hopefully, inexpensive expansion as each Story is essentially contained in a deck of cards. The base game box should have all the board space, tokens, and other bits you need to play. That’s another important thing – sure, I’ll spend $10-$15 for another scenario, but if everything costs $25 or more? That’ll certainly be a detractor. Time Stories is very exciting. It’s a new sort of game (perhaps most similar to Sherlock Holmes: Consulting Detective) that still feels board-gamey, but has a world ripe for exploration. You’ve also got potential for a wide variety of stories – not limited to one time period, or even genre. Announced scenarios include Asylum (the included story in the base game), the Marcy Case set in 1992 in America, The Prophecy of the Dragons set in a magic and dragon-filled alternate-reality middle ages, and Under the Masks set in ancient Egypt. 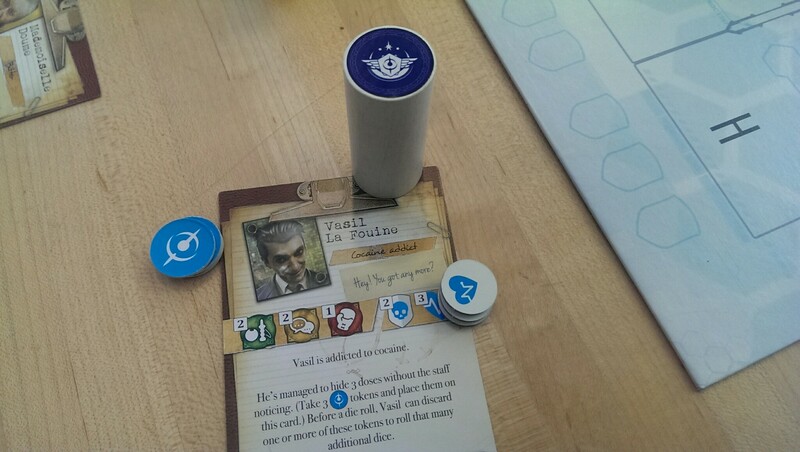 And here… have a batch of fun images of the game and some expansions. Click on one to open a massive gallery view.